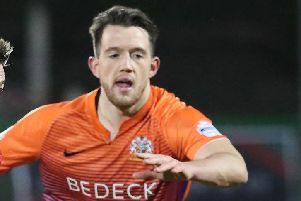 DECLAN DEVINE insists he'd be foolish not to be thinking about retaining the EA Sports Cup this season after his side comfortably marched into the quarter-finals of the competition. The Derry City boss made four changes to his starting XI as the Candy Stripes avoided a potential banana skin by strolling past previously undefeated First Division outfit, Longford Town. With the trophy currently placed proudly in his office at the Ryan McBride Brandywell Stadium, Devine isn't going to give it up without a fight and he admits he's keen on securing a 12th League Cup title for the Foylesiders. The draw for the last eight takes place next Monday, April 8th and when asked if the competition was a priority for his side this season, Devine responded in the affirmative: "Of course it is," he said. "There's three trophies to compete for and obviously this is us into the quarter-final now. We're two games away from a final. One game away from a semi-final which is potentially in your own ground. "We want to win every game. We'd be very foolish to say we weren't interested in winning anything, Of course we do. We want to breed a generation of winners here and want people to understand this is a huge football club. Derry City boss, Declan Devine has his eye on the prize as he watched his team progress to the quarter-finals of the EA Sports Cup. "But we'll take it one step at a time. We're also fully aware that we're only beginning." There was an estimated 800 fans at the Brandywell venue on a wintry Tuesday night to watch Derry improve on their home record under Devine. Derry have won four out of five games at home in all competitions this season, their sole defeat to league champions, Dundalk and Devine was delighted with this latest display and a fourth clean sheet of the season. "The players have been an absolute credit to themselves. Their application and our home record has been very good. We've lost to Dundalk but at the same time against Dundalk we had a right good go. We've been good here so far. "It was a good performance," he added. "Players getting game time and players coming in who haven't had a chance in a while. I was delighted with the performance. To get a performance like that you have to have good people and good players and I think we have that here. "I know they (Longford) made a lot of changes but they have a lot of good players at the club and an exciting style of play and that's credit to the manager and their management staff. "They came here and had a go and we were able to weather their threats, I don't think they created too many chances. We got the ball down and played a bit too and I thought we were very good at times." Junior Ogedi-Uzokwe and Gerardo Bruna both netted their first goals for the club while Eoghan Stoke scored a wonderful 25 yard bullet into the top corner in the 3-0 win. Most pleasing for Devine, however, was the performances of the club's fringe players with French man, Gianni Seraf - making his full debut - impressing alongside the returning Jamie McDonagh. Youngsters, Shane McNamee, Evan Tweed and Conor Gormley all finished the match on the pitch which was particularly pleasing for the City boss who has plenty to think about going into Friday night's North West derby against Finn Harps at Ballybofey. "The people who have played quite a few games recently, they stood up and didn't take their eye off the ball and concentrated on making sure this wasn't a banana skin tonight. So all in all I'm really happy. "Competition for places is everything at the minute. But when you come and watch these young boys and the Derry public have been fantastic. We know money is tight and people are getting it tough but people are coming here and really getting behind the team. And hopefully they're enjoying the football these young boys are playing. "I didn't need to see them tonight and the management staff didn't need to see them tonight to know we have something to think about. We see them on a daily basis. We've good players here, good lads, good effort and commitment. I'm delighted with every one of them but I didn't need tonight to prove that. The guys came in, done the job and they're away home now hopefully to rest up for Friday night. "I'm delighted for them all. I'm delighted for the young players who came on as well. When we came to the club we didn't have any players here and the young players really came to the fore for us. For Shane McNamee, Evan Tweed and Conor Gormley to come on and make an impression as they did, I was delighted. "I was delighted for Jamie McDonagh too after receiving such a harsh suspension. I thought he was excellent. Josh Kerr, who hasn't put a foot wrong since he's come to the club came in tonight and was excellent."